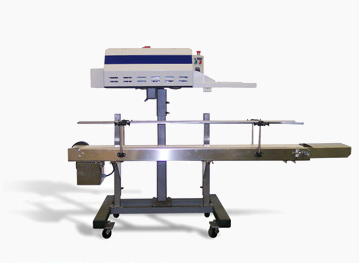 SS1 Bag Sealer | PAK Automation Ltd. The painted Supersealer SS1 Hot Air Bag Sealer has a new air flow system giving each bag the “Perfect Seal”.The SS1 Supersealer is equipped with variable speed and stainless steel components. Auto reverse of belts when temperature is out of range means, “no bag exits the machine without a seal”. It utilizes hot air to continuously seal a wide range of bag materials at high speed and efficiency. The advanced airflow, sophisticated controls, and rugged painted or stainless construction ensures continuous uptime performance in all applications. Seal wheels: 1/2”, 1/4” plain or textured. Power: 115 VAC, 1 Ph, 60 Hz, 15 Amp. seal quality at low maintenance. Accurate and consistent sealing temperature. Flexibility to meet all varieties of applications.